A shape that hugs your sore spots, and a soft fleece cover inspired by cozy quilts. This cleverly shaped water bottle has easy, cozy comfort all wrapped up. Its huggable shape is ideal for an achy back, cramps, or stiff neck, and the soft fleece cover feels like a luxurious cloud of TLC. 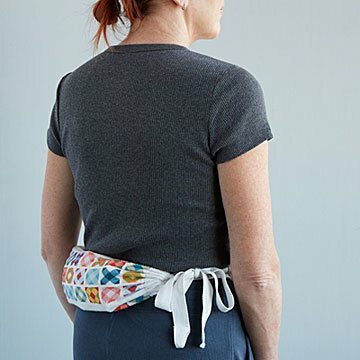 Go ahead and settle in for a TV binge or bedtime, because this no-nonsense soother stays warm for hours. Designed by Richard Yu. Eco-friendly, biodegradable rubber sourced from Sri Lanka. Richard Yu comes from an advertising sales background, including five years working for Wikipedia founder Jimmy Wales. It was then that he had the idea for an elongated hot water bottle. After almost two years of research and development that he funded himself, he walked into London’s prestigious Harrods department store to showcase his product. Seven days later, Richard received his first order from Harrods. The rest, as they say, is warm, cozy history. Outer cover machine wash cold, tumble dry low. Bottle will remain warm for 2-6 hours, depending on environment. Do not use boiling water. Always allow water to cool for 4-5 mins. Do not fill to maximum capacity. Always hold the bottle by the neck when filling with water. Expel any excess air from the bottle before replacing the stopper. Ensure the stopper is secured tightly to prevent leakage. Can be used with ice and cold water. My daughter has suffered for years with endometriosis which includes lower back pain. Finally a heating product that allows freedom of movement while heating the sore muscles.